At the center of the fast-paced racing film Rush is one of the most bromantic rivalries you’ll see on the silver screen this year. 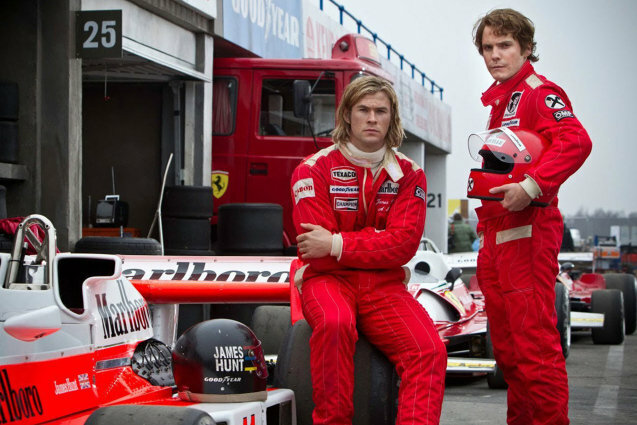 Ron Howard directs the film about 1970s Formula 1 rivals James Hunt (a slimmed down Chris Hemsworth delivering as the cool, lady-killing idol) and Niki Lauda (Daniel Brühl playing his character with a strict reserve fueled by a repressed aggression). Both men were major stars of their time, and their distinct approaches brewed a competitiveness that proves exhilarating to watch on the big screen, not only during many a thrilling race but also during some chest-to-chest and mind-to-mind confrontations. The actors approach their roles with an honest investment, revealing a nice chemistry between these apparent opposites who actually come to learn they need one another as badly as they want to beat each other. Both men have their flaws, and Howard is able to balance sympathy for the characters at different moments in the film’s unfolding drama to make it difficult to decide who we want to cheer for. Despite this keen approach to characterization, Howard remains a heavy-handed storyteller. During the violent aftermath of one crash, a racer is carried away on a stretcher with a leg wound. He throws in a lingering shot of a close-up of the wound. You know, just so you might get a peek at what bone he broke in the crash. Howard also establishes Hunt as someone with a vomiting issue; the character throws up at least four times over the course of the movie. Okay, we get it. But that tendency to overemphasize detail also makes the racing scenes intensely visceral. From the cars whooshing past the screen to the insides of engines, Howard presents it all. Sometimes these scenes only last seconds as montage sequences, collating the most powerful sounds and images in an abstract but impressionistic manner that transcends narrative. Howard should be commended at how much of this story he can pack into montage. The racing scenes become well-balanced against the drama. Neither personal character development nor racing ever overtakes the narrative to the point that the film feels dull either way. The heavy-handedness, however, also appears in the sometimes obnoxious, often overwrought score by Hans Zimmer. But that same zealous controlling hand benefits the film’s authentic recreation of the era via production design, makeup, and costumes. During the sweeping aerial views of the race tracks, the production team even seems to get the color pattern of tents and people during the era. 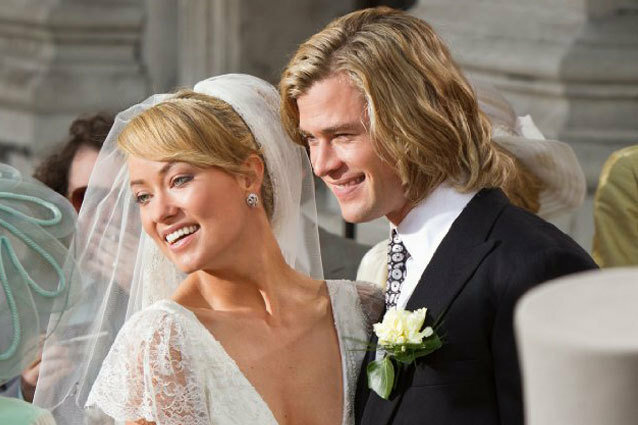 The privileged women who surrounded these men (including Olivia Wilde and Natalie Dormer) offer little more than set-dressing, as the film is all about these two men. The one who truly ties all these production elements together, however, is the movie’s cinematographer, Anthony Dod Mantle, who previously won an Oscar for his work on Slumdog Millionaire. It is his work that captures the light that virtually transports you to the ’70s, whether it shines through the trees or the frizzy, layered hair of the actors. In the end, it all serves to enhance the relationship between Hunt and Lauda. Howard works it all to heightened effect. Sometimes he oversteps the obvious to inspire some eye rolls, but Howard still proves he knows how to make a thrilling film without forgetting its heart.